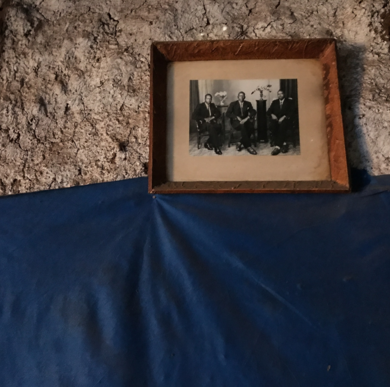 Matilde Simas explores the capacity of photography to generate social change, activate affect, and empower storytelling. Her work focuses on issues of dignity and human rights around the world, illuminating the enduring strength of victims, survivors, people affected by trauma, and the state of endangered ecosystems. In her work, the body and the landscape become subjects of elaborate narratives, but she actively seeks to allow her subjects agency – a way to impact the story and reclaim truth; represent their endurance and give resilience a voice. Faces Behind Atrocity is an award-winning series which documents through portraiture the experience of surviving human trafficking, as well as the journey to healing and recovery. Compelling and thematically and aesthetically original, the pictures demonstrate Matilde’s ability to control composition and image execution, including some interesting photographic qualities, such as efficient lighting, intriguing subject matter, and alluring aesthetics. This is essential, in her view: it activates emotion, which is the switch for taking action. In 2017 Matilde founded Capture Humanity, an artistic collaborative organisation, in which she is lead photographer. The aim is to document humanitarian groups that assist women, children, marginalised communities, and conservation efforts. Patience, commitment, and integrity are the core of their effort to inspire greater creative and social consciousness. From the series Sold, 2017 Nairobi, Kenya. Elena Stanciu: Your photography practice has a strong humanitarian core. When did you start working in this line? What prompted this direction? Matilde Simas: My journey as a humanitarian photographer began in 2014 after a trip to Namibia, where I volunteered to photograph a children’s soup kitchen called Home of Good Hope. It was in a community where hundreds of children were orphaned due to the AIDS/HIV epidemic. The time I spent documenting this organisation and the children was pivotal for me – it allowed me to see the power of photography as an instrument for social change. ES: Is this something you want to achieve with your photography – social change? MS: I want to construct a different society, seeking out underreported stories that need to be told and documenting social inequalities that must be righted. Images are the main access to realities of which we have no direct experience. I believe photography is only the means to a solution. Through my photos I want to take viewers to remote places and close the gap of indifference. I blend journalistic authenticity with art and documentary; my pictures move between online, editorial, and gallery worlds and engage a wider audience in the global issues I document. Being part of awareness campaigns, the press, exhibitions — it all helps create more awareness on the issues I document. ES: Your project Faces Behind Atrocity is a touching report of stories of violence and escape. What can you tell us about this series? MS: The series started in 2017, when I travelled to Nairobi to capture the work of HAART Kenya, a grassroots organisation that works to eradicate trafficking and support survivors in their community and across the country. The original portrait series involved seven young women of four different nationalities, ranging in age from 13 to 16 years old. They were rescued from the horrors of the trafficking world and are in various stages of the healing process. 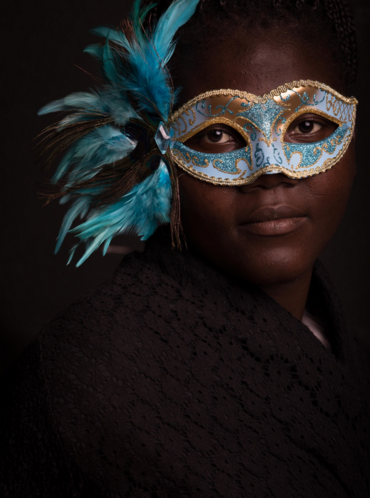 Masked to protect their identities, the survivors allowed me to capture a visual representation of their resilience, beauty, and strength, while also providing a written account of how they were trafficked and the atrocities they faced. This project aims to advocate for and alongside survivors, amplifying their voices, while provoking discussions on human trafficking. I believe art is a powerful tool to create awareness about social injustices – it puts a human face on the problem and can influence people in a way that numbers and academic discussion cannot. I’m extremely proud that this series won several international awards, including the Lucie Foundation Social Cause International Photography Award. Pendo, from the series Faces Behind Atrocity. Tumaini, from the series Faces Behind Atrocity. ES: In your work with victims and survivors of violence, what did you learn about the role of visual representation in the process of recovery? MS: After being told that they have no worth, the survivors tend to have low self-esteem. I feel that creating powerful images that portray these women as brave and beautiful helps them to see themselves in a new way – and see their potential. Seeing the photos showcased in public spaces and having an impact makes them feel empowered and courageous. I learned a lot about the therapeutic applications of photography. Being able to tell your own story and take control of a narrative is incredibly powerful. ES: The general discourse surrounding photojournalism and documentary photography uses the trope and promise of social change. How, specifically, can activists use your work to fight for human rights and social change? What’s the crucial step that we, as viewers, can take from merely looking at these photographs to using them as tools against human trafficking or other forms of abuse and violence? MS: Activist civilian groups can host exhibitions devoted to this kind of social documentary work, helping to close the gap of indifference. My photography baits the emotions of the viewer, stretching perspective, understanding, and compassion – and activists can use this type of work to support their cause. Whether it’s learning more about human trafficking, talking about it in their own spaces, or volunteering with organisations working to combat the issue, I feel that my photography offers a stepping stone for activists – a way to connect people to the problem in a powerful and emotional way. ES: Photography is historically a medium with a claim to knowledge, evidence, and truth, but it can nevertheless be used to manipulate and misinform. What is your view on the use of photography in humanitarian work? Is there some enhanced scrutiny the medium receives in this field? MS: Shooting in the modern world, the wordlessness of photography is often corrupted by misinterpretation. Always assume you know nothing. Context is so important to truth. As a documentary photographer, I must take responsibility for the way my photos are being interpreted – by whom, and for what purpose. From the series A Centuries Old Maasai Custom: Female Genital Mutilation: Makuta, Kenya. ES: How do you perceive the state of documentary photography in the digital age, when we can all turn instantly from passive witnesses to image producers and have millions of viewers over multiple platforms in a matter of minutes? MS: A documentary photographer today is a storyteller, a publisher, a writer, and a marketer who can fully use all the tools available in the digital age to tell and share their stories. These tools are more powerful than ever before, and they changed the role of the photographer from creator to creator and distributor. It’s in that dissemination that the photographer has inherited the power of communication. ES: Are there any challenges to the medium in this context – for example, a struggle for relevance and impact? MS: Fairness and equality are being violated to unimaginable degrees. 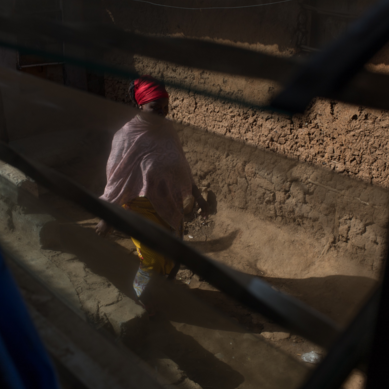 The International Labour Organisation estimates that there are nearly 40 million victims of human trafficking worldwide, more than half of whom are women and girls. It’s a horrific industry that pulls in about $150 billion every year. I think it’s more important now than ever to create social reform photography, which was common in America in the 1930s, where photographers were documenting issues such as poverty, horrific living conditions and child labour, to name a few. Photographers at that time understood that emotion provokes action. From the series Portraits of Myanmar. ES: I’m curious about the balance of aesthetics and subject matter in photography that deals with horrific experiences or human suffering. It’s an extensively discussed topic, but what’s your own take on it? Is there an ethical conundrum when seeking beauty/visually pleasant effects for your viewers, while making records of pain and suffering? MS: I am very much aware of the dangers of beautifying human tragedy; the risk of pictures reinforcing our passivity towards the experience they reveal – and ultimately weakening the message. There will always be an ethical enigma that comes with seeking visually pleasant effects while creating a record of pain and suffering. Faces Behind Atrocity is a portrait series that grabs your eye for the beauty of the women portrayed – yet, when context is provided, an urge for social justice resonates with the viewer. I approach my subjects from a place of the utmost respect and admiration, empowering them to share their stories while capturing and showcasing the resiliency and beauty of the human spirit. I have created a platform for survivors to amplify their voices. My goal is to empower survivors by creating a safe, sensitive, trusting, and collaborative environment. We began growing our relationships by communicating everyone’s feelings about the project. They shared with me their ideas and boundaries, and I committed to respecting them. Our portrait sessions provided the survivors with the power to decide how they wanted to be photographed. We all agreed that we wanted to create portraits to spread awareness about human trafficking and aid in the movement for social change. ES: Any future projects you can share with us? MS: Currently, I’m in Haiti on assignment for an organisation called Limb Kind Foundation, together with documentary director, and screenwriter Mim Paquin, and filmmaker Roberto Herrera, both members of my organisation, Capture Humanity. We work with Limb Kind founder Robert Schulman, as part of an eight-person team, which is comprised of amputee survivors and mentors, prosthesis technicians, and medical professionals – all collaborating to make the lives of children who lost a limb better. Capture Humanity will be documenting the impact that limb loss has had on some of the children of Haiti, from the limited access Haitian children have, to the personal independence and freedom that the prostheses offer. Another project sees Capture Humanity partnering with New York-based organisation Mentari, which mentors and empowers trafficking survivors to reintegrate into the community through a culinary arts program. We’ve been working together to create a cookbook titled Taste of Freedom. The intention behind the cookbook is to create awareness about human trafficking by interweaving success stories and quotes about what freedom means to each of the Mentari clients.